With a name inspired by the farmhouse rums of the French Caribbean, Bar Agricole embodies both the urban and the agricultural in its simple, seasonal fare, organic and biodynamic wine, and artisanal spirits. 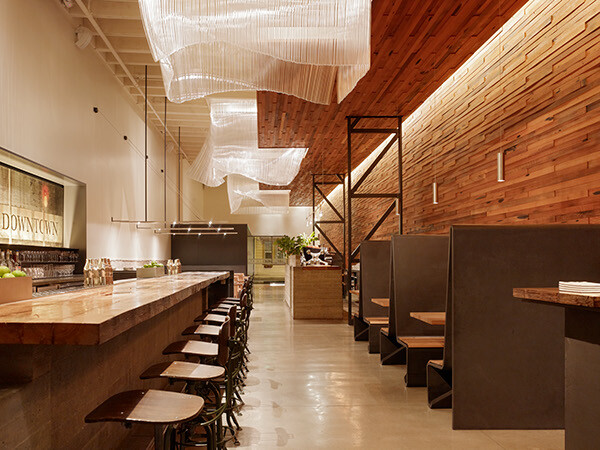 Located on a gritty street in San Francisco’s industrial South of Market district, the restaurant is both down to earth and sophisticated in its approach to food, drink, and the dining experience. Drawing on long-term relationships with local artisans, the architect and owner assembled an expanded design team for the collaborative design-and-build process. The architects worked directly with concrete, wood, metal and glass fabricators to weave their distinct talents together, highlighting individual craft and experimenting with new materials and techniques, while creating a cohesive, welcoming environment. 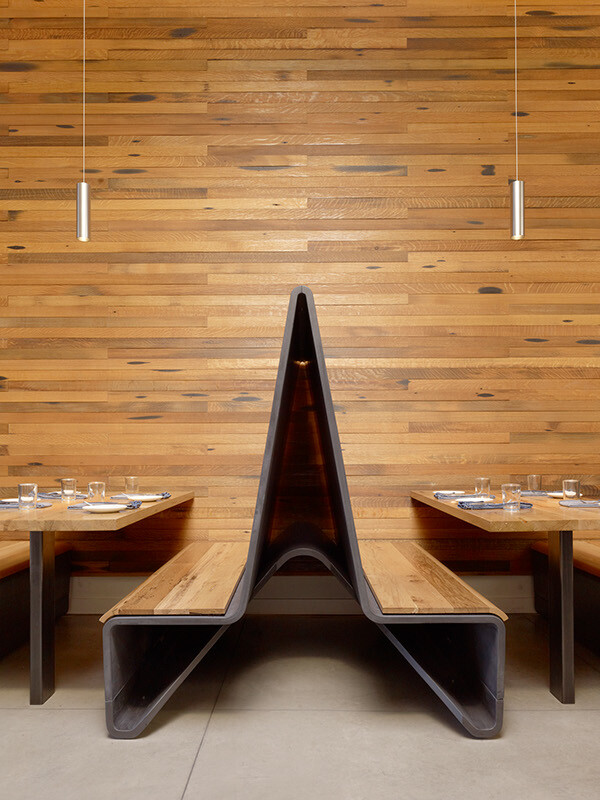 As a primary spatial gesture, the existing long, tall warehouse interior is given a sense of intimacy and scale by a wooden “hull.” The hull is crafted of reclaimed whiskey barrel oak, milled into thin strips and lapped in a scale-like texture. 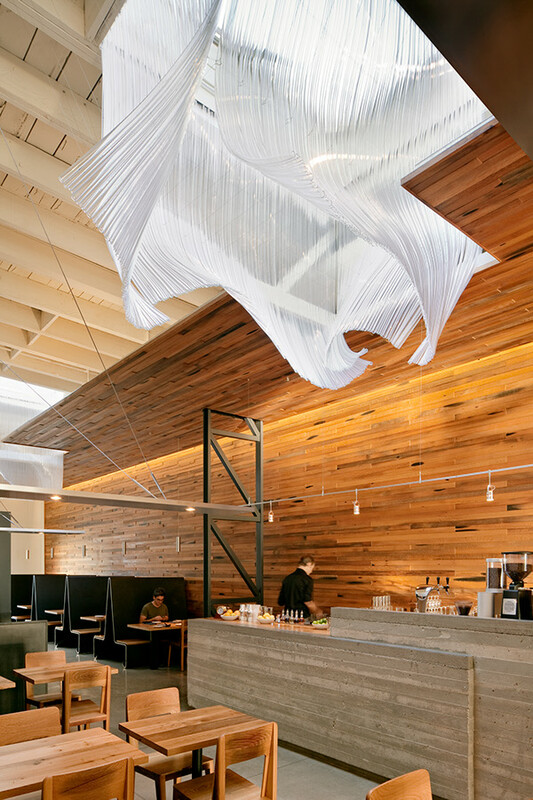 Delicate glass sculptures descend from skylights above the hull, puncturing through the wood ceiling and distributing daylight throughout the dining room. Their airy and fluid lines are formed by warped pyrex cylinders, fused into curvaceous glittering volumes that float gently overhead. The restaurant’s bars, banquettes, and service spaces are arrayed as furniture-like objects within this interior volume. 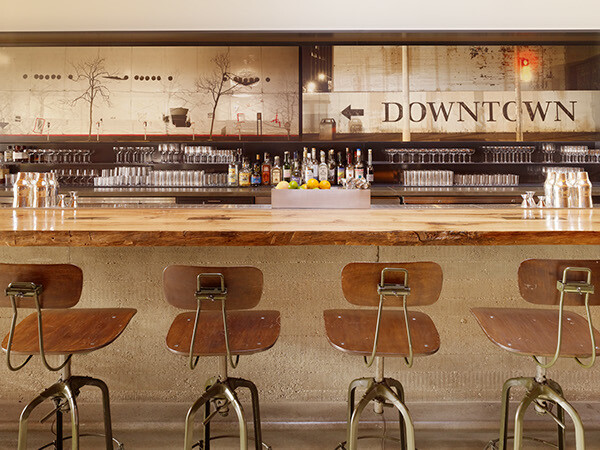 Two bars, made of board-formed concrete and old barn beams, are anchors of space and activity. Contrasting their orthogonal geometry are the sinuous banquettes, also of cast concrete. In the banquettes, however, the concrete is a seemingly-impossible one-inch thick ribbon, achieved using a new ductal concrete. 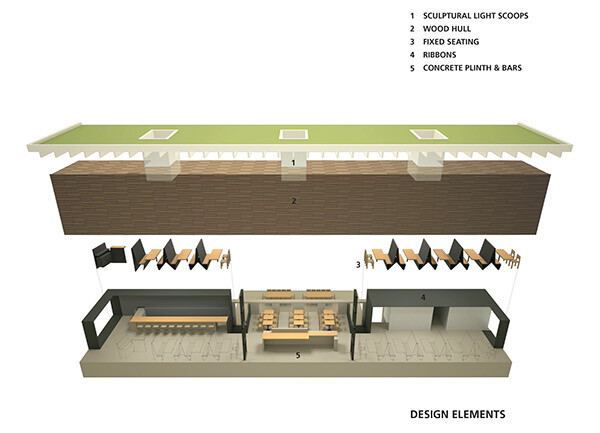 More recycled wood, here riddled with worm holes, warms the concrete for the sitting body and links the booths with the overall project palette. 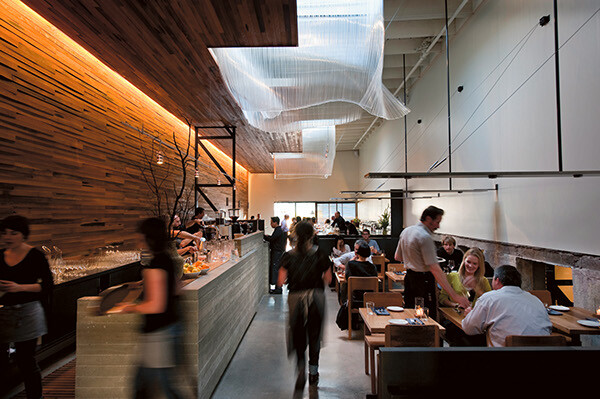 The dining experience does not end at the perimeter of the building envelope. Through a deep steel and glass facade, the dining room connects out to an outdoor courtyard and organic garden. 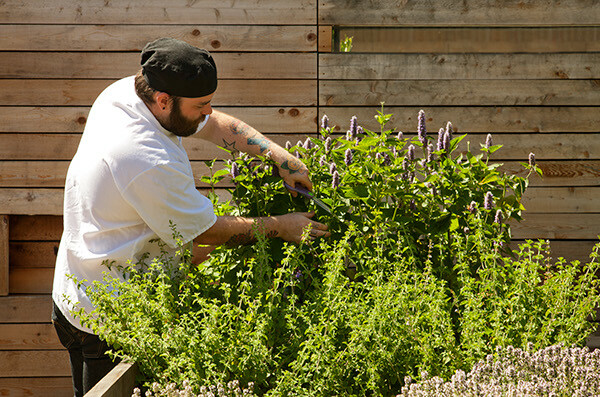 Homegrown herbs for artisanal cocktails are harvested from a series of raised beds, which directly adjoin outdoor dining tables - reconnecting the city dweller to earth and agriculture. Designed as a complement to the restaurant’s menu, the space balances the rough and the refined to create a sensually rich drinking and dining experience. 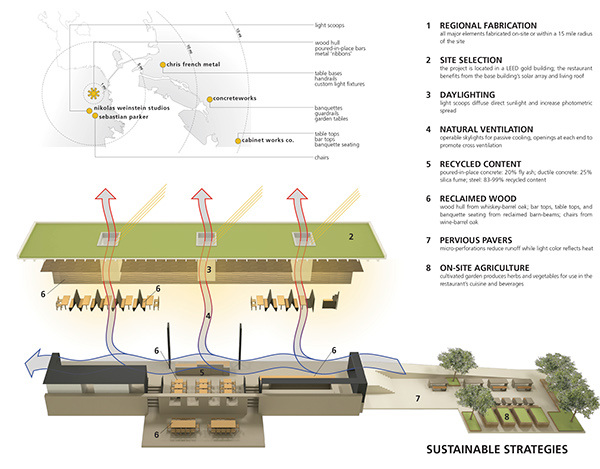 Much like the careful integration of hand-foraged produce sourced from a local network of sustainable farms and gardens, the construction uses durable and sustainable materials, fabricated locally, to achieve the greatest effect in a minimal and efficient manner. 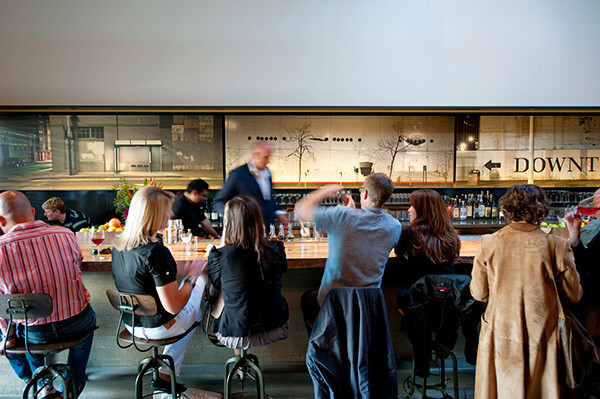 Bar Agricole has achieved LEED CI Platinum certification. 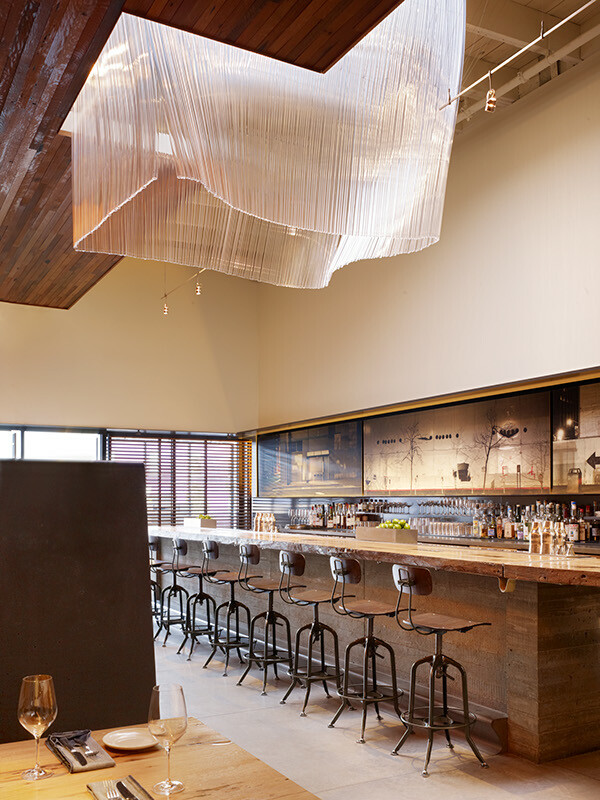 This modern tavern, located in San Francisco's industrial South of Market district, is the product of close collaboration with numerous artists and fabricators. 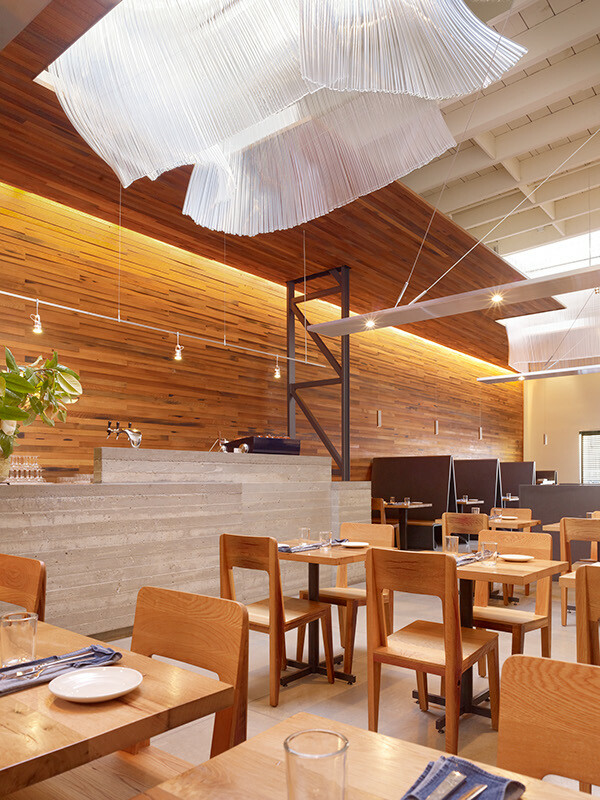 A utilitarian material palette of reclaimed oak, steel, and concrete emphasizes the rustic yet urban nature of the space. 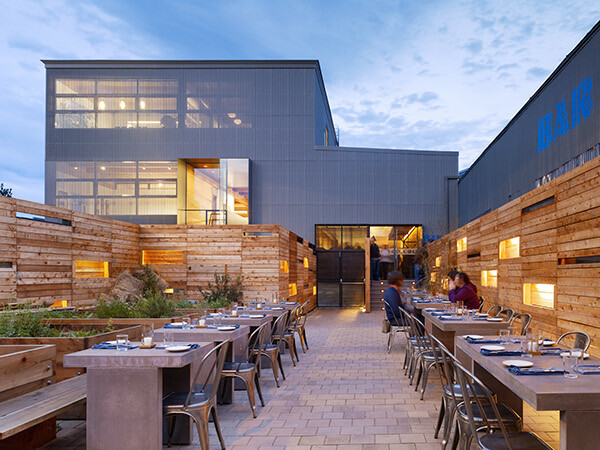 The LEED Platinum certified design takes inspiration from the sustainable agricultural roots of the restaurant's artisanal food and cocktail menu.